How to get file creation date of given file in Java? Home Medium Date Questions Medium File Questions How to get file creation date of given file in Java? Write a program in Java that prints file creation date of given file. We need to use following method of BasicFileAttributes Interface that is present in java.nio.file.attribute. * package. FileTime creationTime() - This method returns FileTime class reference. We need to convert this time into Date. - How to create instance of BasicFileAttributes Interface? How to convert given Date to String? How to convert given String to Date? * @problem How to get file creation time in Java? // Getting file creation time. 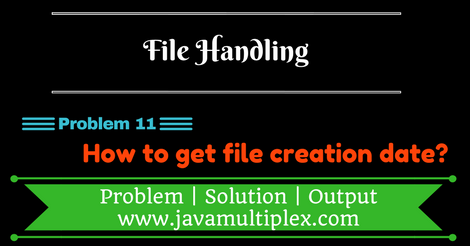 Output - How to get file creation date of given file in Java? Tags : File Handling, file creation time, if else, Scanner, String, File, Date, SimpleDateFormat(), exists(), Regular expression, Path, BasicFileAttributes, FileTime, creationTime(), java.io, java.nio.